Homer has a plan, and he has even named it. ARC. Apocalypse Rescue Cabin. 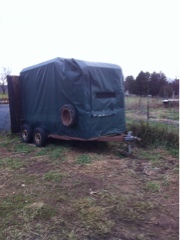 It involves our livestock trailer, rain barrels as pontoons, the camp stove and a few other bits and things. I have a hope. That Homer's plan never has to be enacted.